Everything the council site said I can verify. We decided that it was the best place to show off the town to my seventy-five year old German brother-in-law when he and Roger’s sister were visiting us. We had not done the walk but many of the countless people we had recommended it to whilst we were at the store said it was fantastic. They didn’t tell us you needed a level of fitness that perhaps we didn’t have. Off we set, Ludolf wearing what had become his Australian uniform – hat with fly net set off at a slow pace. Roger took off at a rapid pace but Ludolf soon caught up with him as Roger, doubled over, perspiration dripping from his face struggled for breath. “You should take off at the pace you are going to be able to continue at so that you never have to stop” said Ludolf as he strolled past him, little perspiration evident on his brow. Ludolf, despite his years managed the climb easily at his constant pace. “I’m used to walking in the alps” he informed us when we were all finally at the half way tin roofed shelter. The shelter was obviously an old structure where someone had lived or camped at some point as there was an old cement pebble water tank from which we obtained some drinking water. We looked up and then we looked down and decided to continue upwards to the top of the Bucketts. There are many theories on how the Bucketts were named. Most likely it was from the aboriginal Buckan Buckut (Father of Stones looking down on sacred land) and the European settlers heard this as Bucketts. One of our famous bushrangers Thunderbolt made camp and evaded the law in some of the many caves found in the rocky summit. When we reached an area where we had to rock climb to go further up I decided to stay behind but I became bored waiting and wondering what was up there, I too climbed the rocks to the top. The view was fantastic. Our car was just a spot in the valley, 450 metres below where we were standing. A Peregrine falcon circled above. Descending was much easier that ascending but much harder on the knees and legs. By the time we reached the car my legs were shaking uncontrollably. Ludolf seemed to have no ill-effects at all. 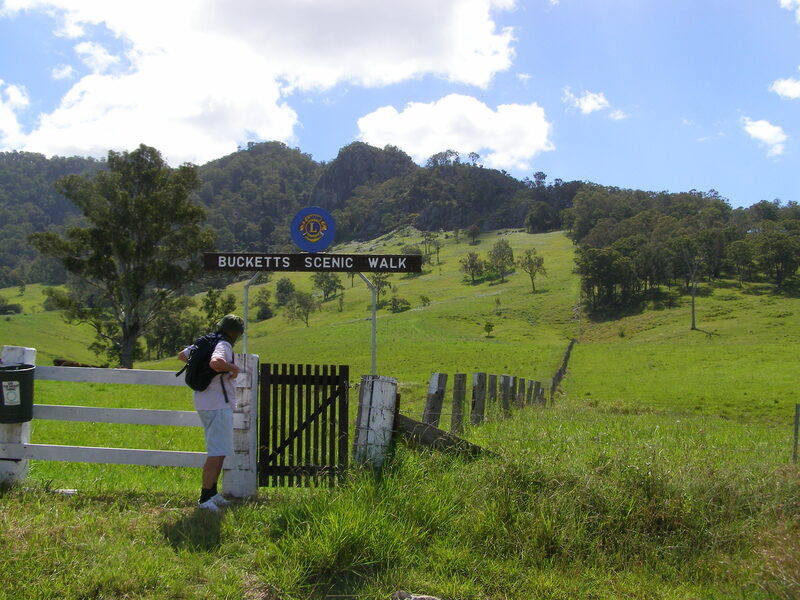 Given our experience I was in awe when a friend decided that she was going to walk the Kokoda Trail in New Guinea and to get herself in shape for it every morning she walked up the Bucketts before breakfast. I haven’t done it since although if ever you are there I’d recommend you do it at least once, taking Ludolf’s advice and taking it slow and steady. 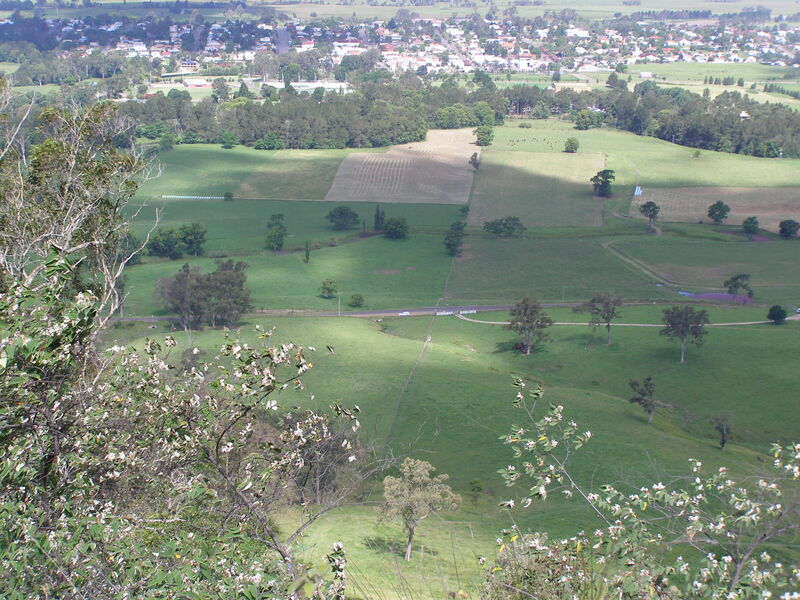 This entry was posted in Look up Look Down, photography, travel and tagged Australia, Bucketts Walk, Gloucester NSW, irene waters, Look up look down photograph challenge. Bookmark the permalink. … with orchids along the way… I’m envious! Love it when the ones up in years can keep up with the rest, or even out walk or out run. Well done, what a view! I’m never likely to get there myself so thank you for sharing with us. I would like to take that scenic walk – how beautiful and natural. – and whew – all that green! Yes it is beautiful and green. One day – perhaps. Thanks for commenting.